Refelting at the time of a move or setup is typical, but most times, the cloth can be saved. 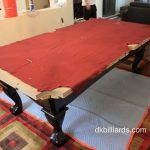 The billiard mechanic who disassembled this Brunswick Contender Series, carefully removed the cloth and folded it up for re-use. Notice how the cloth looks as though it won’t fit? We can often stretch cloth two and three times (except Simonis) before it becomes unusable. This burgundy felt has years of life left in it, and the Costa Mesa, California owner was happy not to incur extra costs. Contender Series tables aren’t my favorite. They look pretty, but as an installer, I know that the frame is the bare minimum of strength to hold the one inch slates. All tables in this series require extra effort to make sure the pieces of the base are as snug and aligned as possible to support the weight of the stones. We got this one snugged up well and the slates leveled. It is ready to play, with occasional help of a short cue on the sides. It looks great in the room and will be fun for the entire family. An alternative to the entry level Brunswick Contender, is C.L. Bailey Dutchess. Just like the Brunswick above, the Dutchess is manufactured in China, offers traditional design with a dark stain, and fits in your budget. 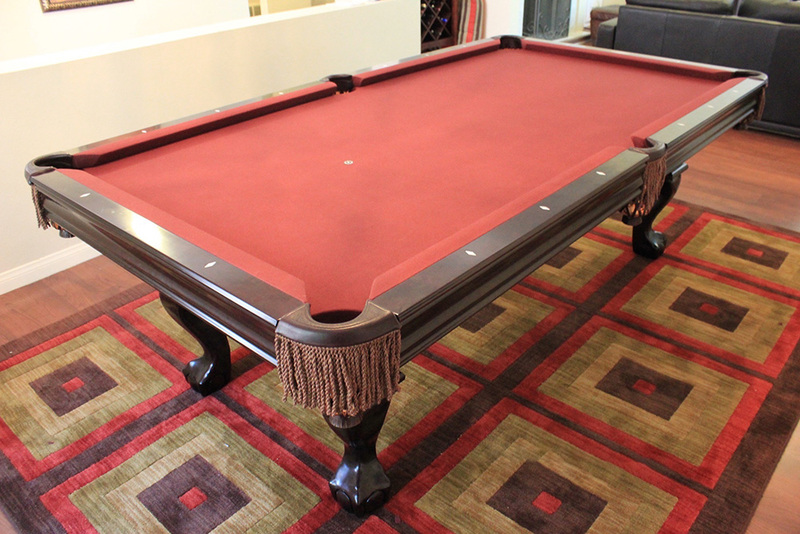 Import pool table can save you cash, but do your homework and make sure that you are getting a well built table. The Dutchess offers better construction and likely costs less than its Brunswick counterpart.